The cost to switch from oil to gas in New York can range from $12,500–$18,000. And we know—that’s a BIG range. Want a fair cost estimate for your home? Give us a call. We’ll send over a heating expert to assess your home and give you a quote. *Oil to gas conversions are performed in the summer/spring only. These projects require working with the utility company and the NYC Department of Buildings, which often causes delays we can't control. To avoid leaving you without heat, we choose not to perform conversions during cold weather months. Please check back with us in the spring. We'll be happy to help you with your conversion project at that time! If your home doesn’t already have a gas line, you’ll need a utility company to add one to your house. You see, most towns/areas have what’s called “gas mains” buried underground. These gas mains store large amounts of natural gas. But in order to get that gas into your home (to fuel your gas appliances), you need a smaller pipe that runs from the gas mains to your home. 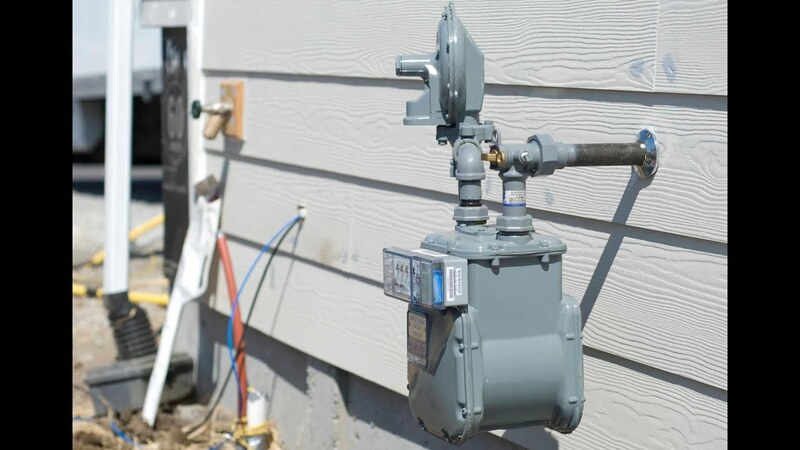 Not sure if you already have a gas line at your home? Well, you can check by searching for your home’s gas meter. Gas meters measure the amount of gas your home uses and, therefore, are only installed on home’s that actually have gas lines. Don’t see a gas meter? Then you might not have a gas line installed at your home and will need to contact a utility company in your area to install one. The good news? Some utility companies will waive the fee to add a gas line if you agree to use them as your gas provider. When you make the switch from oil to gas, you may also need your chimney lined to prevent carbon monoxide and other flue gases from leaking into your home. You see, most homes’ oil heating appliances actually use the chimney to vent their exhaust fuels, which can produce sulphur deposits inside your chimney. The problem is that, once you switch to gas, the chemicals produced by gas appliances mix with those sulphur deposits. Together, the sulphur and combustion gases eventually deteriorate the inner lining of your chimney, which produces tiny cracks in the chimney. If left unchecked, dangerous gases can enter the home through those cracks in the chimney. Cast-in-place liners: These chimney liners consist of a material similar to concrete, which is poured down the chimney to create a barrier of insulation. Cast-in-place liners also last 50+ years and are a good choice for chimneys with structural problems since they also reinforce the chimney. Stainless steel flue liners: Stainless steel flue liners are durable and easy to install, but they’re typically the most expensive out of all the liners. They last 15–20 years and they often meet state and local venting codes. In a residential application, you will most likely need to update your current appliances to a gas-fired appliance. Some units can be retrofitted with a power gas burner, if the manufacturer and NYC DOB approves. In most cases, the equipment will need to be changed and pricing will vary based on system type and equipment selection and size. When you switch to gas, you’ll need to remove your old oil tank because it’s a potential environmental hazard. This can be fairly costly, especially if your oil tank is located underground (though this is fairly rare in New York City). The labor required to complete this oil-to-gas-conversion accounts for the bulk of the overall cost. As you get written estimates from different contractors about what they charge, beware of those who come in at super low prices. When it comes to getting a new boiler or furnace installed, what you get is what you pay for. The bottom line? A cheap install price usually means poor work. And a poorly installed boiler or furnace just leads to more repairs and trouble down the road. So when you’re looking at contractors, check out their online customer reviews to gauge if customers are satisfied with their work. Also, make sure that all contractors are licensed and insured and work for a company that’s been around for at least 10 years. The switch from oil to gas: Is it worth it? With such an expensive price tag you’re probably wondering if it’s worth it to make the switch from oil to gas. Are there any tax credits or incentives I can take advantage of? These could make your overall cost cheaper. How long would it take to recoup the cost to switch to gas? If it’s longer than you’re planning on living in your home, converting may not be worth it financially. One study found that New York City homeowners could pay back the cost of switching in 4.25 years. Want a quote based on your New York home? Give us a call and we’ll be happy to answer any questions about switching from oil to gas. And if you’d like a quote, we can help you schedule an appointment with one of our trusted techs to visit your home and give you a project estimate.